Thamel, Kathmandu, said in an interview to an architecture magazine, “We cannot know exactly when an earthquake of immense magnitude will strike us, but it is certain that one is due soon; the law of averages point towards this fact.” He also said, “…I do pray that we have another ten years time before the next big one occurs.” In his view, given this amount of time, disaster management programs in all wards of the Capital would be in place, and people would be able to react with greater efficiency. Well, his words have come true. Nepal was struck by a disastrous earthquake of 7.9 magnitude on April 25, 2015, and a series of aftershocks, two of which were of 6.8 and 7.3 magnitudes, respectively. More than 8000 people have lost their lives, thousands more have been injured, and hundreds of thousands of houses have been destroyed. The aftershocks have continued for a long time now. But, it is a credit to all Nepalis that they have shown strong resolution to start their lives all over again with renewed vigour and optimism. People in far-flung villages have started to rebuild their devastated homes once again, not waiting for others to do it for them. This is, after all, what Nepalis are known for: their vast pool of courage, their ever present enthusiasm, and their never-say-die spirit. A guy carrying bamboo pieces to make pillar for tents. Indeed, most people had already begun to go back to their normal lives barely 10 days or so after the massive April 25 quake. 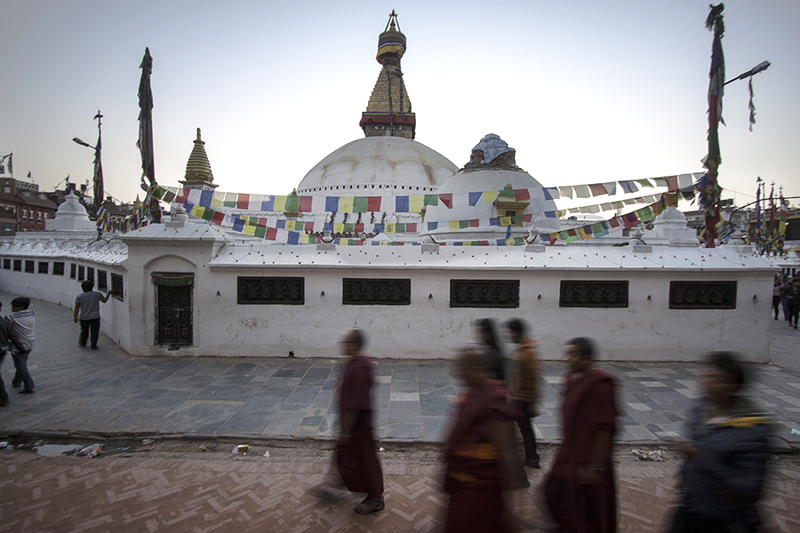 Things were rapidly moving towards normalcy in Kathmandu. Then, the big aftershock of May 12 struck, leading to renewed fear in the hearts of people. However, it is easily noticeable that now people aren’t easily panicked with smaller aftershocks. Many have taken it in their stride. The school are slated to be opened soon, and the traffic is already heavier on the streets. Of course, there are many commercial establishments like shops, malls, cinema halls, and so on those are still closed. It seems that their opening depends on when and whether they are given the green light by the concerned authorities as being safe for public use. 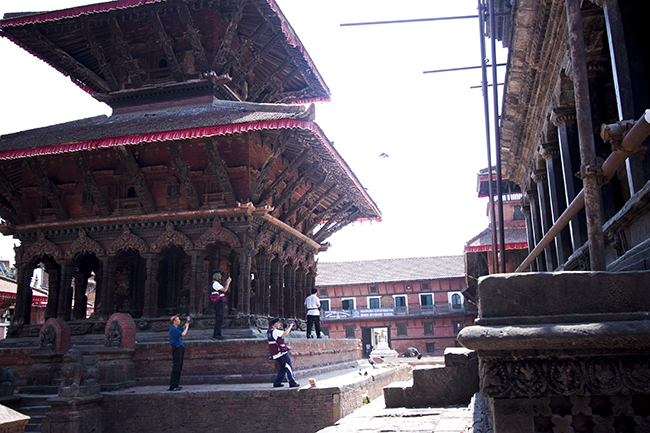 I was also pleased to see a group of Chinese tourists around Kathmandu Durbar Square, clicking snaps that would be a part of history, and around which they would be able to weave interesting tales for folks back home. Yes, the Chinese expert is right; Nepalis are a most resilient people, and unless nature has other plans, you can take it from me that the whole of Nepal, and particularly the Kathmandu Valley, will be back on its feet very soon. The scenery all around is still fantastic; the weather is, as usual, pleasant, and the people are always welcoming. Many monuments might have been destroyed, but much more remains to enthral you. So, don’t cancel your plans, come to Nepal. You might get really good bargains, and yes, the rhinos, the royal Bengal tigers, the elephants, and what not in the forests of Chitwan and Bardiya continue to roam their particular empires, come what may. 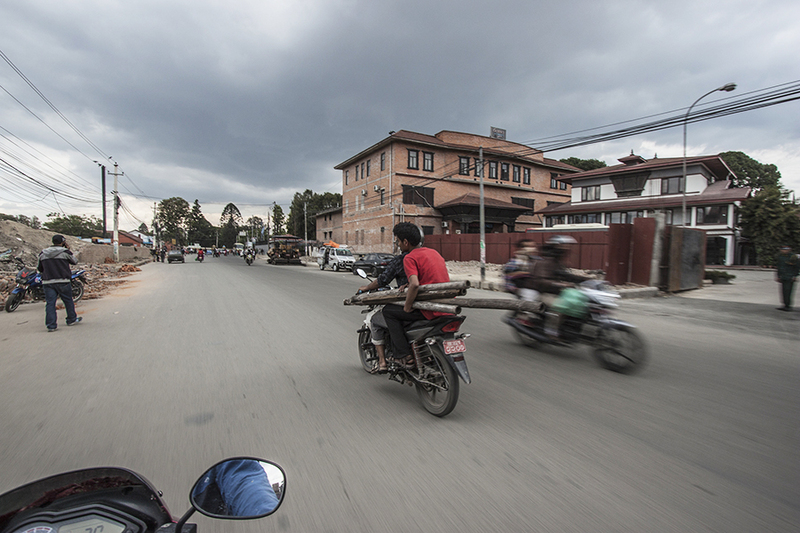 First hand experience from Kerung – Kathmandu Highway. Upcoming festivals in Nepal, with dates. This entry was posted in Nepal and tagged Nepal Earthquake, nepal is rising by royalmt. Bookmark the permalink.